"A little cigar with a Big Flavor!" 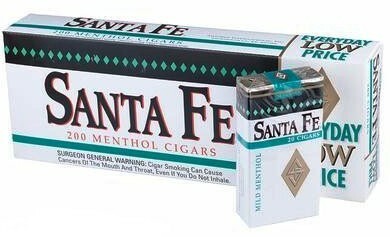 Santa Fe Mild Menthol Little Filtered Cigars are a top-rated favorite whether you’re on a budget or time conscious, Santa Fe provides an array of delicious, choice tobacco blends that offer the quick flavor fix you need— in half the time of a full-sized cigar, with all of the same quality! Whether you’re craving a fruity smoke, refreshing menthol, or just classic, hearty tobacco, when you keep a pack of these gems handy, every smoke break is satisfying.